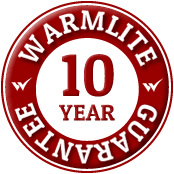 Warmlite can provide you with a top quality installation of replacement fascias and soffits, reducing maintenance and improving the look of your home. All our fascia and soffit installations use top quality materials and we guarantee all work and products for ten years. Flat Roofs installed by an expert local team. Our experienced consultants will always give you best advice on the best flat roof options in our range without any pressure or obligation. We thrive on recommendations from our many, many happy customers, and we want you to join them. We can supply a range of colours,profiles and complementary edge trims to provide a solution that is sympathetic to your property. Whatever your flat roof requirement, you can be confident that a Sarnafil® Roof Assured installation will provide you with a solution that looks good and provides lasting performance. For further information about our Sarnafil flat roofs and roofline work, a free site survey with a no obligation quotation or to arrange an appointment.